It's good to revisit classic literature on the topic of loose parts from time to time. 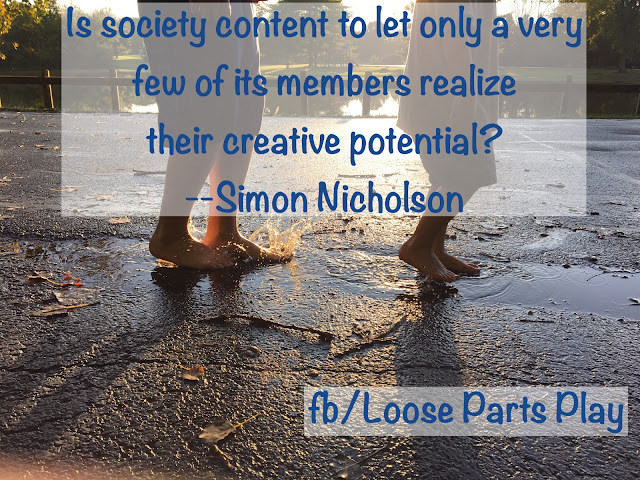 Nicholson largely wrote on loose parts from the perspective of creating playgrounds and outdoor spaces. 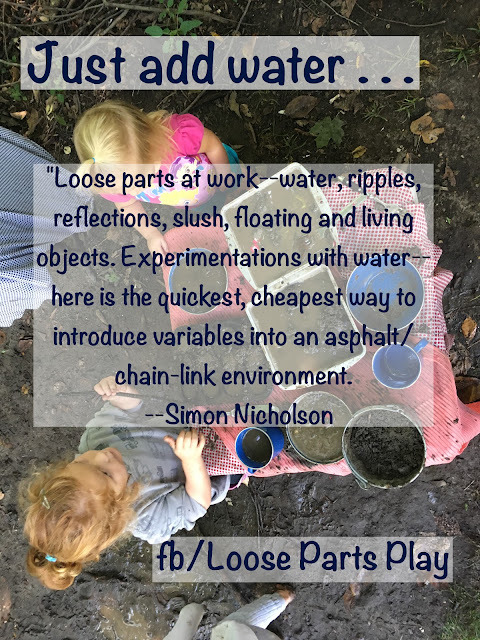 Marc Armitage has repeatedly said in our Loose Parts Play group that Simon Nicholson never used the term "open-ended" in the Theory of Loose Parts. 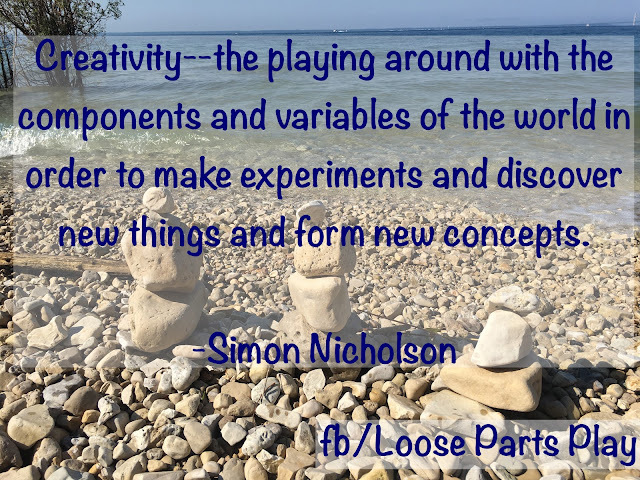 It seems that because we often see children having open-ended opportunities as they play with loose parts that we have put this phrase as one of the descriptors. Let's take a look at what Simon Nicholson, the one who coined the phrase, had to say about the topic. Nicholson starts the article attacking the lie that creativity is rare and for the few who are "gifted" that is perpetuated by society. The "gifted few" are not the only ones who can "solve environmental problems". Most people are not given the opportunity or made to feel as they are not able/competent to explore building and construction. In particular, children often have many restrictions on their experimentation. He shares some basic observations on creativity (note quote below on children interacting). Nicholson also mentions that many places of human interaction (schools, hospitals, airports, museums, etc.) do not work as they do not have the needed loose parts and are "clean, static and impossible to play around with." The adults/planners had all the fun designing and the "fun and creativity (has) been stolen: children and adults and the community have been grossly cheated." Contributing influences at his time included adventure playgrounds (Anarchy magazine 1961ish) and behavioral planning, such as the discovery method. Check the example of caves below and the need for interdisciplinary units and the blending of indoors/outdoors. A connection to environmental education was made, looking at real-life problems, getting children outdoors and out of the school confines. He also looked at the art world and museums, sharing examples of people were most engaged with exhibits that had interactive elements. He concludes with 4 steps to bring this theory to more effectiveness. "Creativity--the playing around with the components and variables of the world in order to make experiments and discover new things and form new concepts." "Young children (often) find the world incredibly restricted--a world where they cannot play with building and making things, or play with fluids, water, fire or living objects, and all the things that satisfy one's curiosity and give us the pleasure that results from discovery and invention." "There is evidence that all children love to interact with variables such as materials and shapes; smells and other physical phenomena, such as electricity, magnetism and gravity; media such as gases and fluids; sounds, music and motion; chemical interactions, cooking and fire; and other people, and animals, plants, words, concepts and ideas. 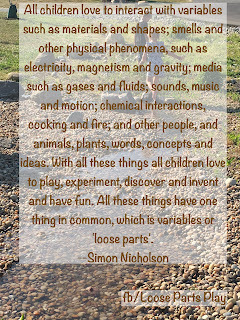 With all these things all children love to play, experiment, discover and invent and have fun. 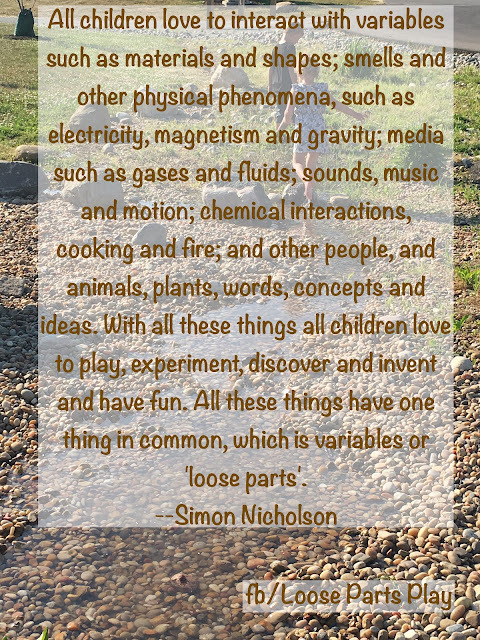 All these things have one thing in common, which is variables or 'loose parts'." The quintessential quote--" In any environment, both the degree of inventiveness and creativity, and the possibility of discovery, are directly proportional to the number and kind of variables in it." "In terms of loose parts we can discern a natural evolution from creative play and participation with wood, hammers, ropes, nails and fire, to creative play and participation with the total process of design and planning of regions in cities." Another often quoted snippet-- "Children learn most readily and easily in a laboratory type environment where they can experiment, enjoy and find out things for themselves." "By allowing learning to take place outdoors, and fun and games to occur indoors, the distinction between education and recreation began to disappear." Educational evaluation is important! "What did children do with the loose parts? What did they discover or rediscover? What concepts were involved? Did they carry their ideas back into the community and their family? Out of all possible materials that could be provided, which ones were the most fun to play with and the most capable of stimulating the cognitive, social and physical learning processes?" 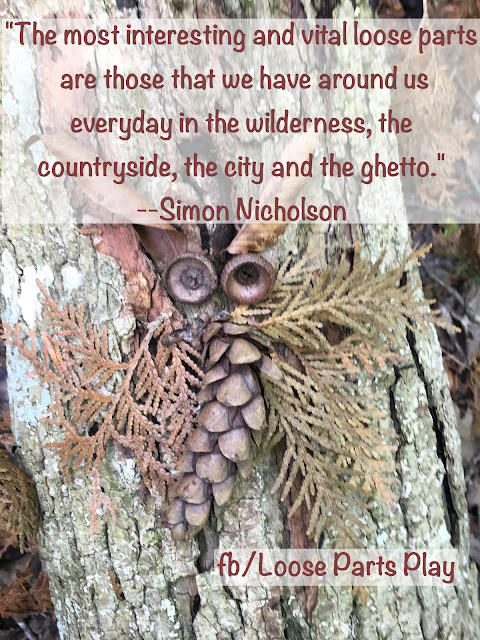 "The most interesting and vital loose parts are those that we have around us everyday in the wilderness, the countryside, the city and the ghetto." "Although it is fine to allow scientists and artists to invent things, how about allowing everybody else to be creative and inventive also?" "The process of community involvement, once started, never stops. The environment and its parts is always changing and there is no telling what it will look like." (I love this about outdoor classrooms--they are never done, but responding to needs and interests of those who use the space." 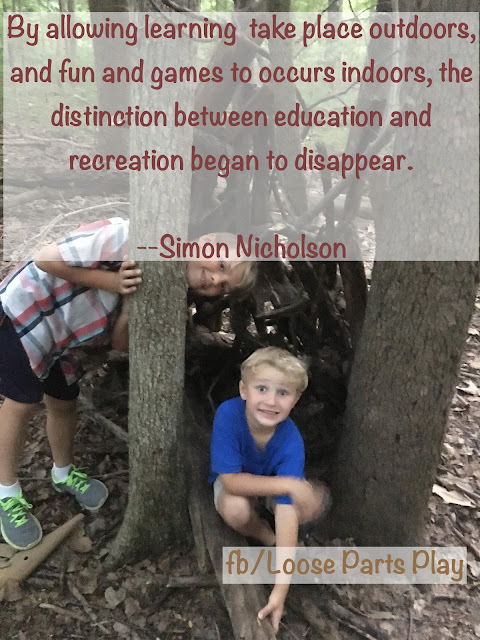 "In early childhood there is no important difference between play and work, art and science, recreation and education-the either/or classification normally applied by adults to a child's environment." 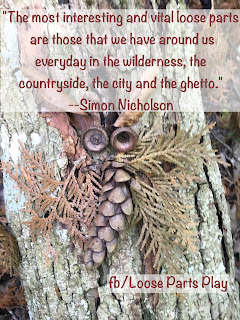 The "ex-quotient"--My own phrase from observations I have made, well before I "got into" loose parts. I need to revisit this with my knowledge on loose parts! Read my thoughts here. Look for ways to make spaces more interactive--how can the children and adults in the space also invent and build? 1. Give top priority to where the children are. Children are in schools, day-care, hospitals, etc.--these need immediate transformation! "Even if a local community is sold on the idea of a pocket-park or adventure playground it is still better to use the asphalt area of an elementary school for it, for this is where the children are." 2. Let children play a part in the process. They enjoy the process of design, looking at the problem, the requirements, planning alternatives, etc. 3. Use an interdisciplinary approach. 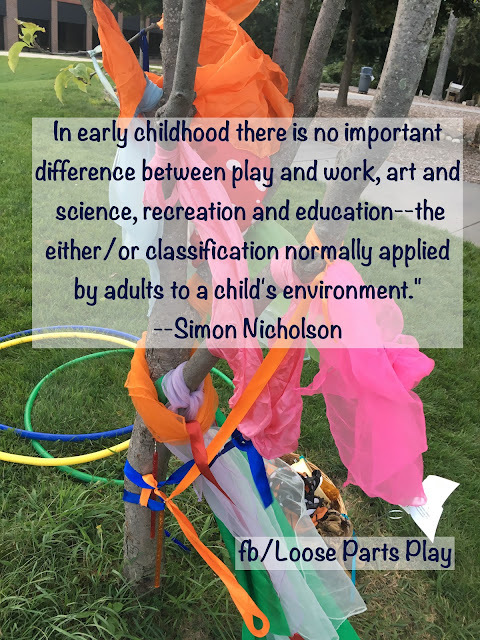 Play/work, art/science, recreation/education are the same for children with no apparent distinctions made in early childhood. 4. Establish a clearing-house for information. Loose parts are not only restricted to play--there can be experimentation, invention, and more! While play worker principles are great for many settings and definitely have a connection to loose parts play, they may not be applicable in every situation. 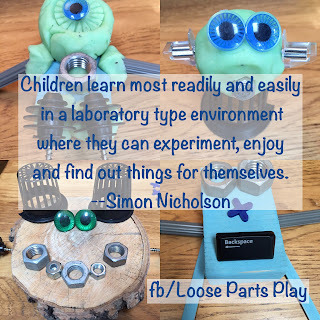 There are many places where loose parts are being implemented--these are all unique. Can we be patient of others' applications of loose parts and maybe even understanding of different sets of circumstances that may not look like ours? Is there really a "right" way to do loose parts or are there MANY right ways that look very different? 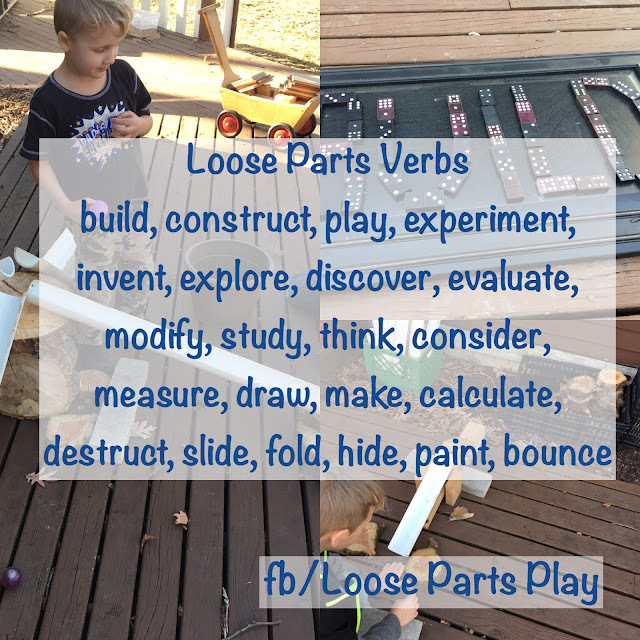 Here is my list of 30+ ways to approach loose parts--I'm sure there are many more. Perhaps there can be more context and curricular ties to loose parts. Perhaps some applications may be more than just having loose parts available, but using them to solve problems. The discovery method takes TIME! In many of today's classrooms, there is a lot of pressure for increased academic performance. 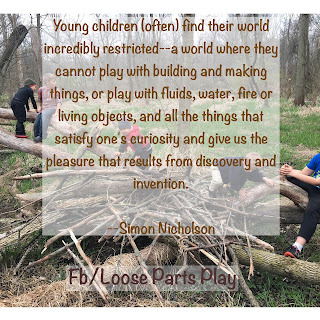 How can we allow the exploration of loose parts (even connected to curricular needs as evidenced by the cave example) and still meet the learning standards and requirements? Loose parts are not just for children, adults can have that spirit of inventiveness and creativity as well. I really have liked the show "The New Creatives" which can be found on BYUtv. 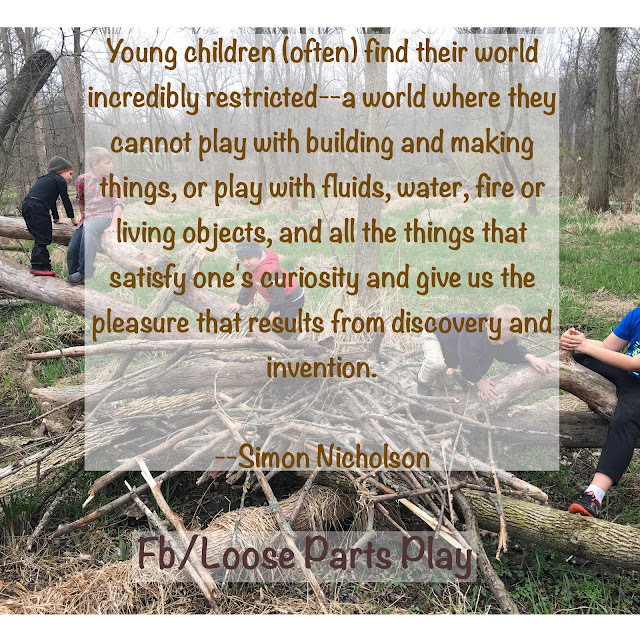 How do we as adults engage in the theory of loose parts? For many of us, it is setting a backdrop for these experiences with children. We enjoy the hunt, the find, the setting up of spaces where children can design their play and experimentation. "Variables" do not have to be "things"--it might be concepts, sound, light, etc. This article was written before I was born. I know many of us who are over 35 or so had less restricted childhoods; however, Nicholson mentions this issue 46 years ago. Are his words making an impact? Why don't we see a bigger impact? I think there is a resurgence in understanding this concept more. 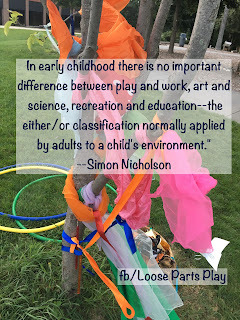 As I mention many times in the Loose Parts Play group, I believe this to be a timeless principle. It is how many of the "older" generation grew up scavenging for things in the woods. We have moved to a largely indoor, over scheduled, and electronic childhood; however, many are bucking that trend and allowing children to explore, experiment, and invent. As I think on my own childhood, I had books available, such as the Junk Artist's Workshop and Inventor's Workshop, that showed examples (and maybe gave permission) to create and explore with castoffs/scavenged items. I was in high ability classes that perhaps allowed for experimentation and creativity more--how do we bring this to more classes? I had large amounts of unrestricted outdoor time when we gathered and collected, sold/bartered, constructed, experimented, and played. Like this? Follow my page, Loose Parts Play, on Facebook! Find our international GROUP, Loose Parts Play, there as well. Also check out my blog section just on Loose Parts Play.